A Joyful Noise: Who Was Benjamin? We hear much about Jacob’s favorite son, Joseph upon whom he bestowed a coat of many colors. This Joseph was sold into slavery because his brothers were jealous and despised his visions and dreams, yet he continued to received favor even as a slave, as a prisoner and eventually favor found him as a ruler over Egypt second onto the King. You will remember the 7 good years where grain and corn was stored in warehouses, and the 7 years of famine which caused many from foreign lands to come to Joseph to purchase food. 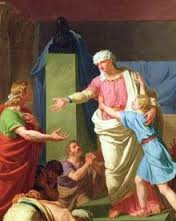 News of food in Egypt caused Jacob to send his son’s to purchase food. Immediately Joseph recognized his brothers, but the 14 years in the sun had tanned and matured him and they did not know their own brother. Joseph taunted them, calling them spies and to prove their good intentions, Joseph demanded that they bring their youngest brother Benjamin, with them on the next sale of food. He also demanded they leave Simeon as a token of their honesty. Gen 42:14 But Joseph said to them, “It is as I spoke to you, saying, ‘You are spies!’ 15 In this manner you shall be tested: By the life of Pharaoh, you shall not leave this place unless your youngest brother comes here. 16 Send one of you, and let him bring your brother; and you shall be kept in prison, that your words may be tested to see whether there is any truth in you; or else, by the life of Pharaoh, surely you are spies!” 17 So he put them all together in prison three days. You will remember that when their food ran out again, they were forced to convince their father Jacob to allow Benjamin to return to Egypt with them. Joseph was overjoyed to see his young brother, and had a feast for them, giving Benjamin more food and more clothing than the others. As the brothers left to return home, Joseph told his servants to hide his silver cup in Benjamin’s sack of food. Soon, they were stopped with accusations of thievery. Joseph had said, who ever stole my cup shall become my servant. Naturally when the cup was discovered with Benjamin, the brothers could not contain themselves tearing their clothes as they returned to Joseph with tears and Judah spoke up begging him not to harm their young brother Benjamin. You will remember that finally Joseph asked everyone of his servants to leave as he wept and revealed to them that he was indeed their lost brother Joseph - - but God had ordained all this to happen for a reason. Israel's first king, Saul—a tall, strong, regal-looking man—was a Benjamite. His reign began well: "And Saul answered and said, "Am not I a Benjamite, of the smallest of the tribes of Israel, and my family the least of all the families of the tribe of Benjamin? Why then do you speak like this to me?" (I Samuel 9:21). God even "gave him another heart" so that he prophesied with the prophets. Benjamin was the least and youngest of Jacob’s 12 sons. His tribe was the smallest but from his linage came the first King of Israel, King Saul. And later the apostle Paul who wrote many of the epistles that reveal deeper truths available to us as Christians. So what can we learn from this story. Benjamin was the least in the kingdom, and at times we feel small and ineffective, but understand that within you is the power to be King and rule and reign. You may also become an Apostle, which means “A Sent One,” to share the Good News about God’s Love. In our own way, we can be a part of the whole picture and move mountains together. As we pray over our city, may we be reminded that many of our citizens feel inferior, small, not good enough, but God is able to change them into another person by his regenerating power. I love that story. It's hard to read without becoming emotional. Great point; we the appearance of a person means nothing when they haver been chose and are doing the work of our Father. "I Am Stirring the Waters"